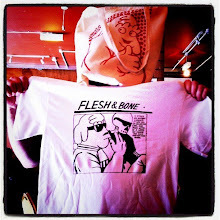 Museums Press have just published the official compilation catalogue of Flesh & Bone, from the front to the back it's all there pretty much. Over 179 strips! 96 pages! Full Colour glossy cover with black and white insides! A5 landscape format! It's everything you look for in a comic book, it's got a spine too so you know it's legit. You can buy one direct from the Museums Press website here , first orders ship out from Glasgow tomorrow so if you're sprightly you may get to nestle down (on the bog) with a copy come Christmas Day. They be retailin' at £6.50 a pop. "Brilliantly witty, funny and unusual. David Bailey's comic strips are fantastic to look at and hilarious to read"
"I never miss an episode of Flesh & Bone"